Rear Shock bottom mounting bolt sheers again. 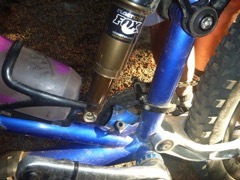 Riding in Sticky Forest near Wanaka the rear suspension bottom mounting bolt sheered. This is the second time this had happened the first being at Rotorua a few years previously.. This time the frame mounting brackets were bent quite a bit but luckily the shock piston was not damaged, only the bushes. I got these replaced with a different "older version" bush and using my spacers which amazingly we found. (this is a story in itself as only one was with the bike in the evening when we walked back to the car. Early next morning we retraced our steps (riding route) and amazingly I found the other mounting spacer.) We bought a new 6mm x 40mm bolt from a bolt shop in Wanaka. (It was the longest they had so fortunately was just the right length). A few washers to make up for the replacement bush not having a shoulder.